On August 7-8, OSU hosted the executive committee meeting of the American Society of Civil Engineers (ASCE) Geomatics Division (GMD). Committee members from CCE included Assistant Professors Dan Gillins and Mike Olsen, and Associate Professor Chris Parrish as well PhD Graduate Student Michael Dennis. 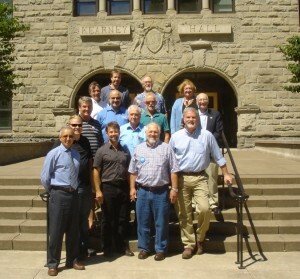 The focus of the meeting was to develop a new version of the ASCE Engineering Surveying Manual – last updated in 1984. This manual, to be edited by Prof. Gillins is intended to provide important concepts for practicing engineering surveyors and will cover significant advances in geomatics over the past few decades and their role in civil engineering. Topics at the executive committee meeting included discussions on model law and the future of surveying as well as ASCE’s newly formed Utility Engineering and Surveying Institute (UESI), which takes effect October 1, 2015.